Individualism and collectivism, egoism and altruism, are interwoven threads that make up the social fabric of all organizations. In consequence, political behavior is an integral part of organizational life. These two interconnected characteristics of human behavior--conformism and opportunism--account for most of the actions and interactions that take place in organizations every day. This volume examines all kinds of organizations from a political perspective, analyzing them in terms of social power and politics. It presents several theories of power and compares them as it scrutinizes the political layout of organizations. For ease of understanding, the book applies the language of political games to describe organizational politics in terms borrowed from the realm of sports, such as contesters, playgrounds, encounters, rules of the game, strategies and tactics, scores, and victories and defeats. It thoroughly analyzes the concepts of social power and social influence from various points of view. Samuel outlines the variety of political games that are played in the realm of organizations, listing nine types of games in which individual level politics, group level politics, and organizational level politics take place. While scrutinizing the political layout of organizations, he also demonstrates how major issues dealt with through processes of decision-making turn into political agendas within organizations. He addresses the issue of managerial politics, drawing upon research that shows how managers influence their subordinates, and how executives conduct power struggles and political maneuvers to defend their lucrative positions. 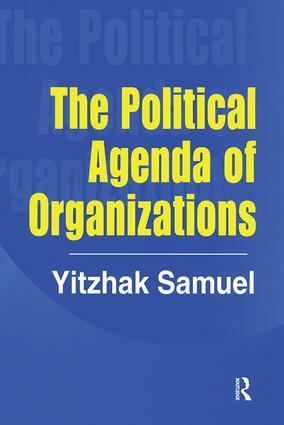 The Political Agenda of Organizations is an enlightening analysis of the power and influence in business organizations and will be of interest to sociologists and other social scientists as well as students of management and business administration.